It makes me smile to think I’ve flown across the Tasman Sea to go to the beach in the middle of winter. But it’s not just any beach. 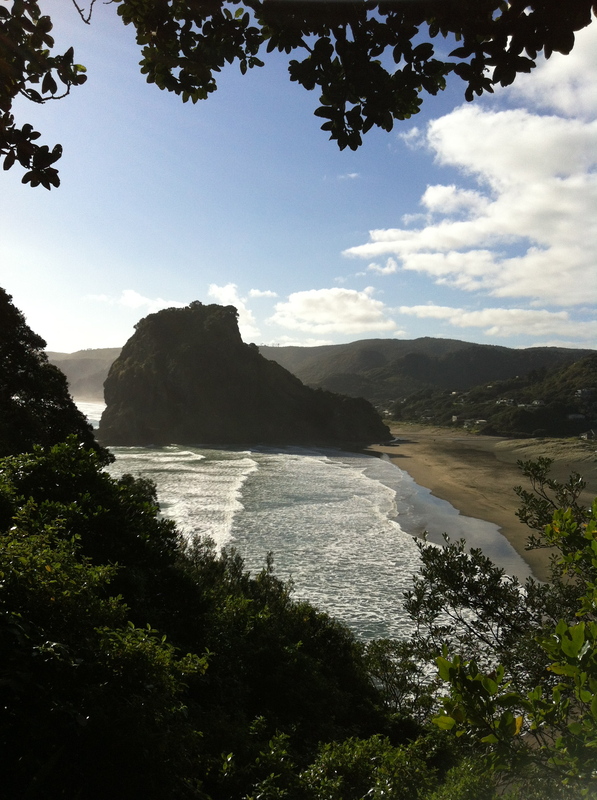 I’m at Piha Beach, the secluded jewel on the west coast of Auckland. I had to abandon my visit to Piha on the last visit to New Zealand due to car trouble and I now realize I wasn’t meant to experience Piha then as it would’ve been a rushed visit en route from the north of Auckland to the central part of the island. But this time I am here specifically and have 2 days of freedom to explore the area’s black sand beaches, majestic rock formations and walking tracks along the headlands and coastal forests. When I was guided to come here on these exact dates about 6 weeks ago, I didn’t know of the astrology that would be occurring at the time but I have arrived in the middle of the Grand Sextile, the double Trine bringing the rare energy of earth and water together to form a 6 pointed star configuration. This alignment is an amazing gift of opportunity as it also represents the sacred geometry of the Merkabah, the light body that surrounds each of us. And given the purpose of my journey was to work on my own light body, there is no coincidence that I am experiencing this alignment in one of the most magical and light infused places on the North Island. The energies here are extraordinary, emanating all around from within the distinctive rugged rocks and wild seas to the gentle fern forests and flowing waterfalls. It is Feminine in its essence and Lemurian in its heart. This is where Source energy meets Gaia, where Spirit and Earth come together and it is when this convergence of energy fills the Heart centre that it becomes possible to burst open the power of creation. I am overwhelmed by the fertile energies here, the beauty in merging the Physical and the Spiritual. To sit and breathe with these landscapes is simply the most purest form of natural healing.